Four players make their much-deserved First Grade debuts for the mighty Adelaide Buffalos in Round 1 this weekend. 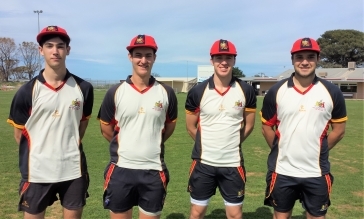 The club is extremely proud to see (from L to R) Tom Mather, Cameron Bullard, Matthew Fisher and Lain Beckett get their start against Southern Districts in Round 1. Tom Mather is in his 8th season at Adelaide CC having started in Ray Sutton Shield sides and developed impressively as he has moved up the ranks. Similarly, Cam Bullard has progressed strongly through Adelaide's teams, and through SACA reperesentative sides, since his start in our Under 14 White's six years back now. Matt Fisher has joined the club whilst on a holiday, via Adelaide favourite, former Test star and now Strikers Coach Jason 'Dizzy' Gillespie. 'Fish' plays for Yorkshire CCC, having debuted for Dizzy's Yorkshire side in first class cricket at just 17 years of age. Lain Beckett comes to us from Premier Cricket ranks in NSW and the ACT, having recently moved to South Australia. Lain has quickly shown what he is capable of with both bat and ball throughout SACA's pre-season 'Redbacks League'.